Talk about stylish! 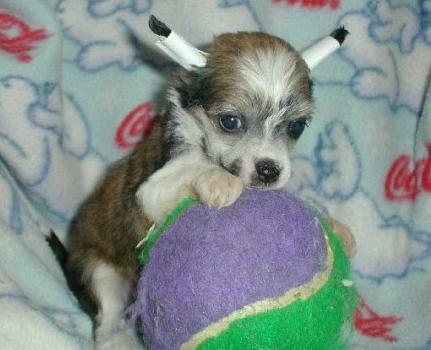 Chinese Crested Dogs are small enough to qualify for the toy size. They are a bit longer than they are tall, with straight legs, and tiny, rabbit-like feet. They sport a curved tail, which they carry upright with pride and enthusiasm. 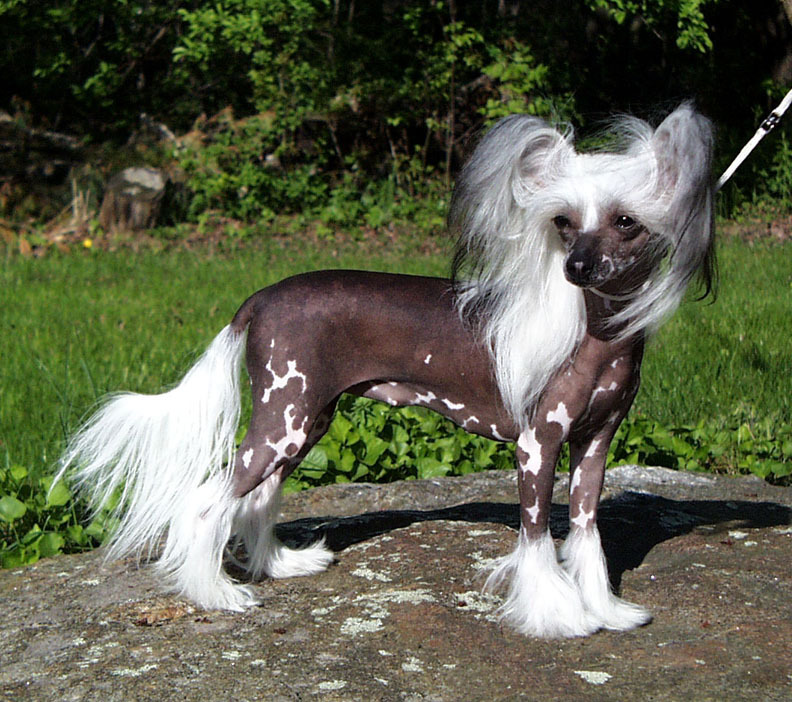 The unique, delicate-looking Chinese Crested Dog comes in one of two coats: hairless and powderpuff. 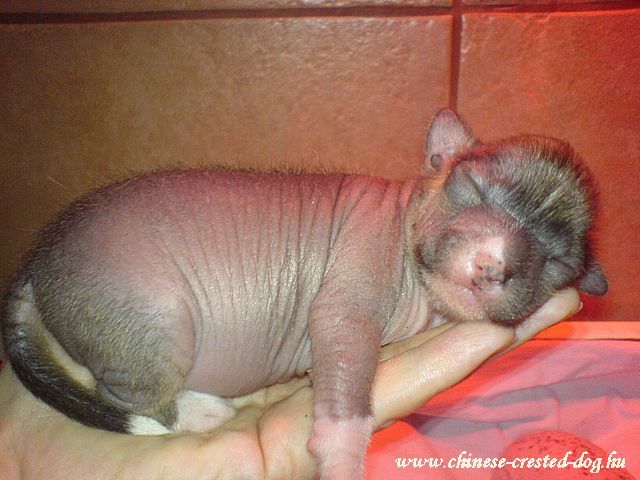 The hairless variety has hair only on their head, feet, and tail. The head is adorned with a flowing mane of fur just begging to be styled. The feet are covered in fine fur, and the tail is a proud plume. 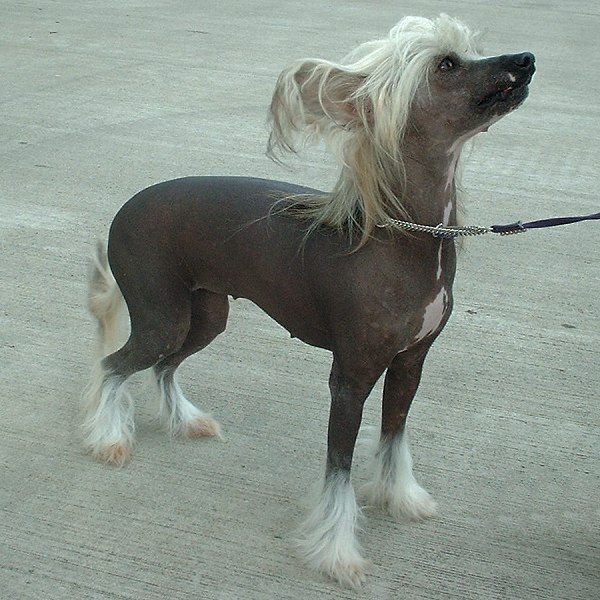 The Chinese Crested Hairless Dog has ears that are quite large, erect, and often poke out through the fine, flowing hair on their heads. Their skin is velvety to the touch. The other coat variety is affectionately referred to as a powderpuff, and they have a fine, long, straight coat all over their bodies. Their ears are either erect like their hairless counterparts or droop down. 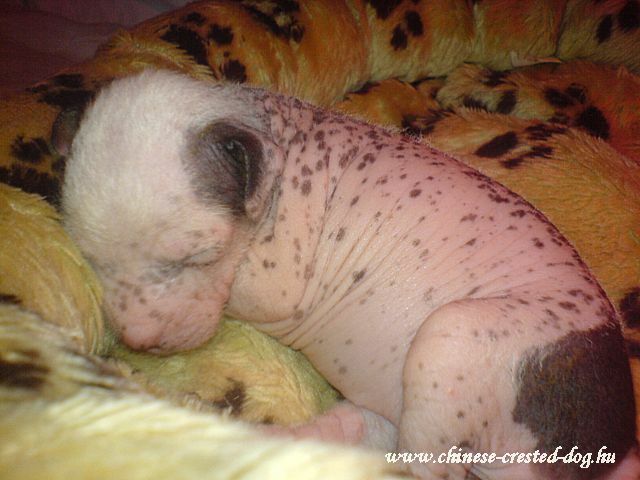 Interestingly, one hairless and one powderpuff are often born together in one litter of Chinese Crested Dog puppies. Regardless of their coat, these dogs are playful cuddle-buddies with a gentle demeanor. 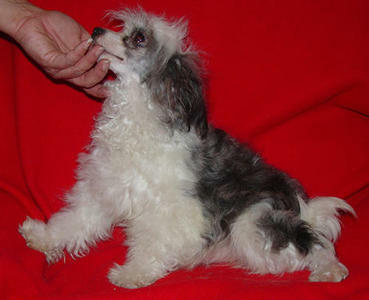 Height (Male) 11 - 13"
Chinese Crested Dogs are good at using their paws like hands. 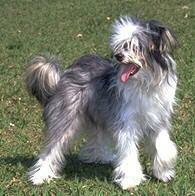 Many people are surprised when they first pick up a Chinese Crested Dog because the dog hugs them right back! They can hold their toys in unique ways and grab food with their agile paws. They can also climb. In fact, their climbing skill is something to watch out for they have a curious nature and will climb up things that would be impossible for another dog who doesnt have their patented paws or small size. 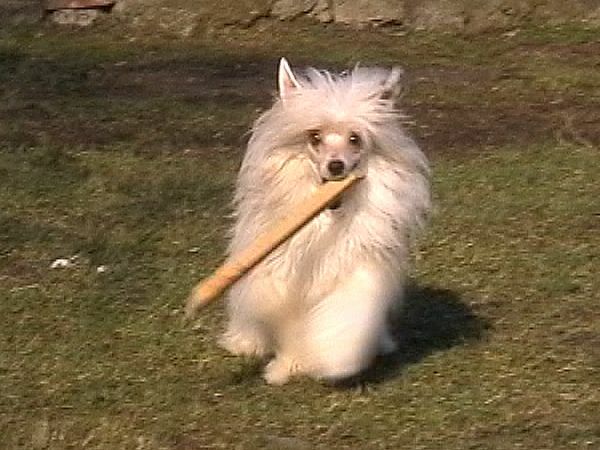 A Chinese Crested Dog will also cheerfully dig holes anywhere they think they can, so training them and establishing ground rules for no-dig zones is important. 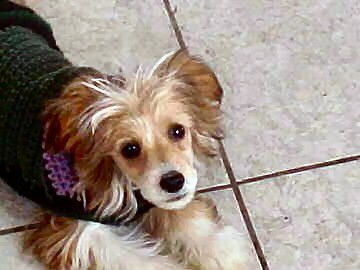 They are exceptionally bright little dogs, and they love to learn tricks and perform them to entertain others. 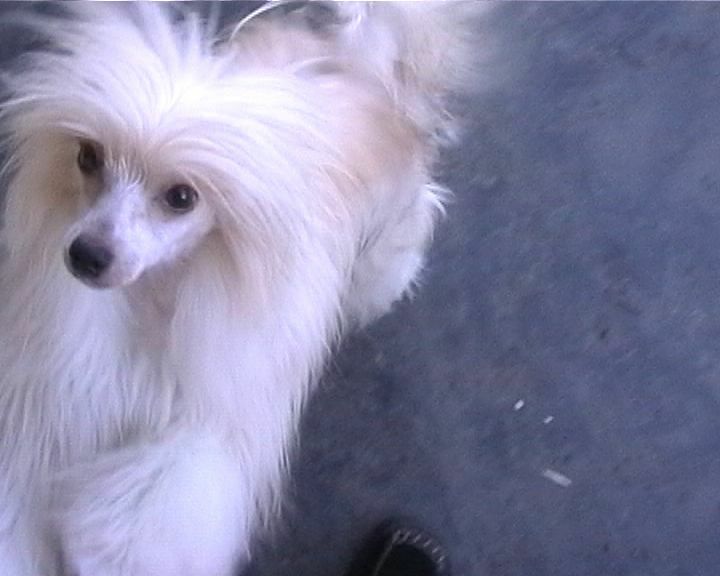 They are excellent with children, dogs, and other pets, and they are not prone to barking. They are such devoted animals that if they ever wind up with a new owner, they may not take well to the new guy. 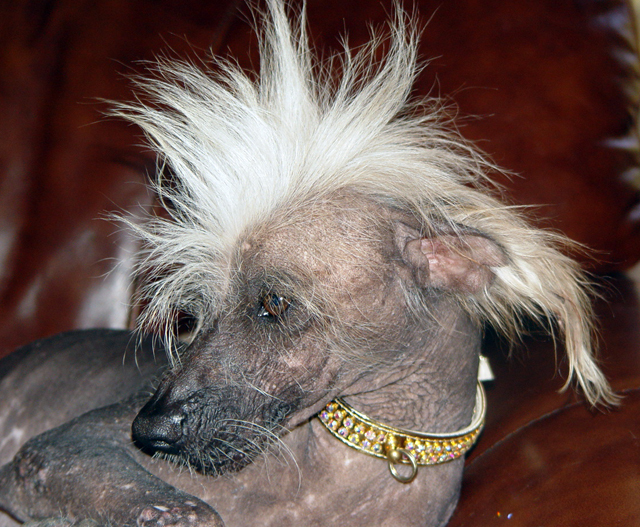 Please keep that adjustment period in mind if you are adopting a Chinese Crested Dog from a previous owner. This dog is perfect for hair styling. 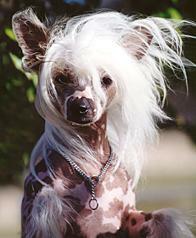 A natural-born beauty queen, the grooming requirements for Chinese Crested Dogs depends on the kind of coat they have. They should both be brushed daily, though the powderpuffs have more ground to cover. 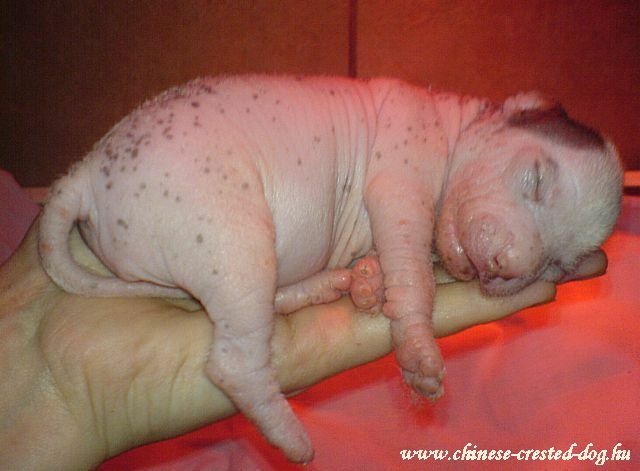 The hairless variety has a lot of exposed skin, which needs special attention, like sunscreen to prevent sunburn. Massaging some moisturizer into their skin helps it keep that velvet-smooth texture, and bathing frequently can help prevent unsightly blemishes. 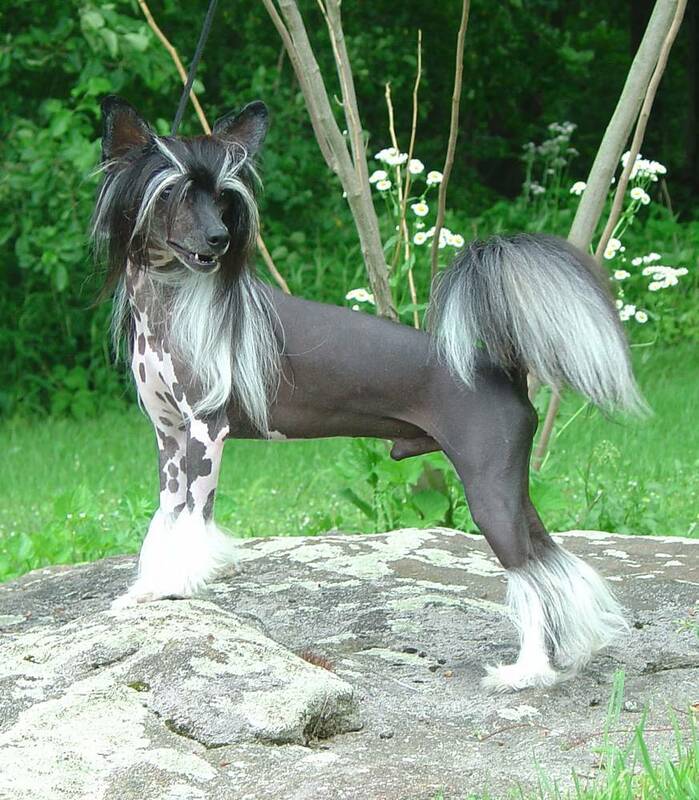 Despite their long hair, Chinese Crested Dogs shed very little, so they can be a good choice for people who are sensitive to pet dander. They do well in apartment situations and dont require much in the way of exercise. They are perfectly happy to play games indoors, such as chasing around a ball or learning new tricks. 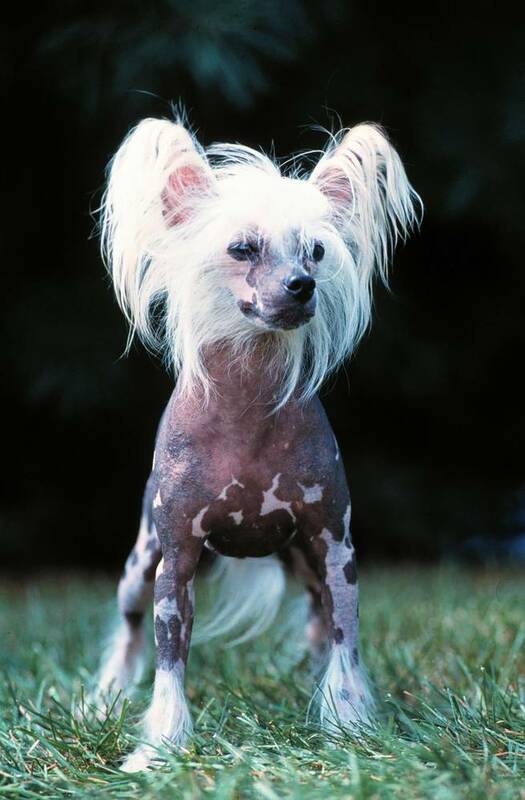 Chinese Crested Hairless Dogs are super clean animals and rarely have issues with ticks, fleas, or body odor. The hairless variety is not a fan of the cold, so warmer climates are preferred or have a coat ready for them to wear. 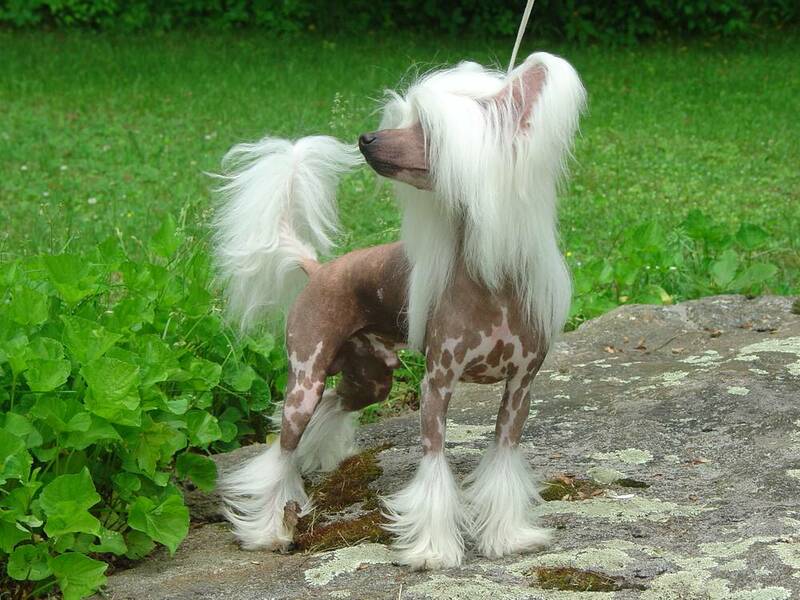 The Chinese Crested Dog has been around a long time, since the 13th century. 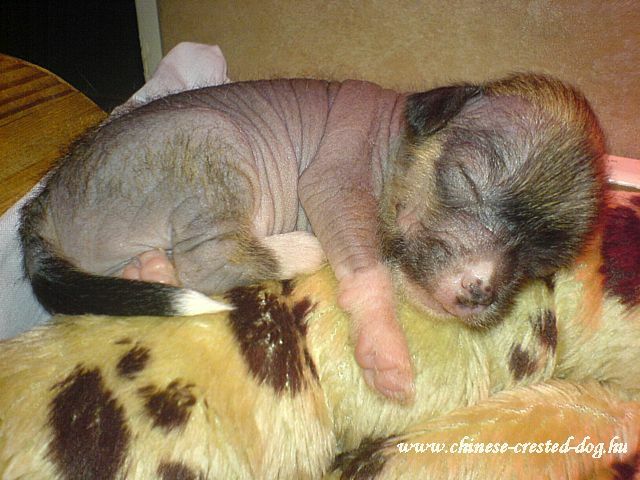 They started in China, and their ancestors may have been a type of hairless dog born in Africa. They were often traded by merchants and sailors, finding their way from port to port all over the world. 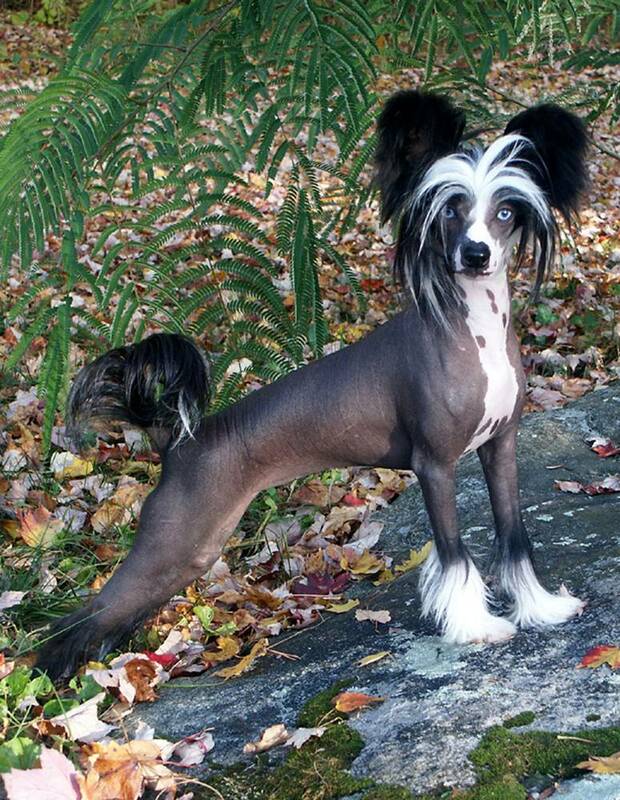 When explorers reached Central and South America, they were surprised to find that the Chinese Crested Dog had beaten them there. They soon spread throughout Asia and Africa. By the time the 18th century rolled around, paintings of these eye-catching dogs posing with their Chinese companions had started to reach Europe. By the 19th century, their beautiful forms were appearing in European art and architecture. 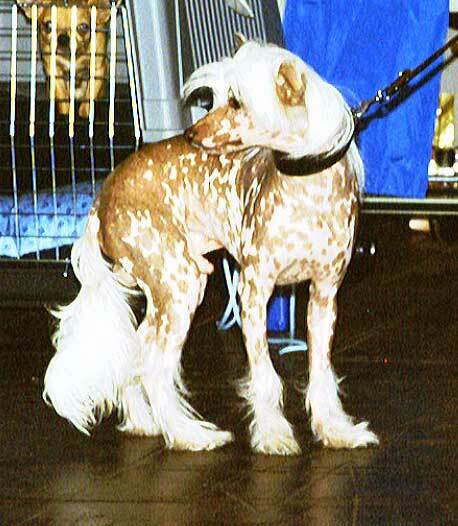 After a lot of touring around, the AKC recognized Chinese Crested Dogs in 1991. A fairly recent addition to the United States, these dogs have actually been around a long time and have traveled to the far corners of the world, serving as devoted companions to people in many walks of life.